Powerful calculator and universal answering machine. Is there a better alternative to iPhi? Is iPhi really the best app in Science category? Will iPhi work good on macOS 10.13.4? find solutions for mathematic problems like Integrals or Linear Algebra. answer concrete scientific questions like „What is the distance from Earth to Mars". provide general info about a sheer unlimited number of things. From „Oxygen" to „United States". iPhi needs a review. Be the first to review this app and get the discussion started! iPhi needs a rating. Be the first to rate this app and get the discussion started! use realtime data for questions like „what is the weather for tomorrow?" or „20 Dollars in Euro". even answer trivia questions like „Movies with Leonardo DiCaprio". For all these different purposes iPhi is a clean, disturbance free Interface that puts the information you requested into focus. Provides a search history that is document based. So you can store and later load the way you found the solution to your complex problem. Special simplified Input methods for often used search queries like Differentiate, Integrate, Linear Algebra operations and 2D/3D Plotting. 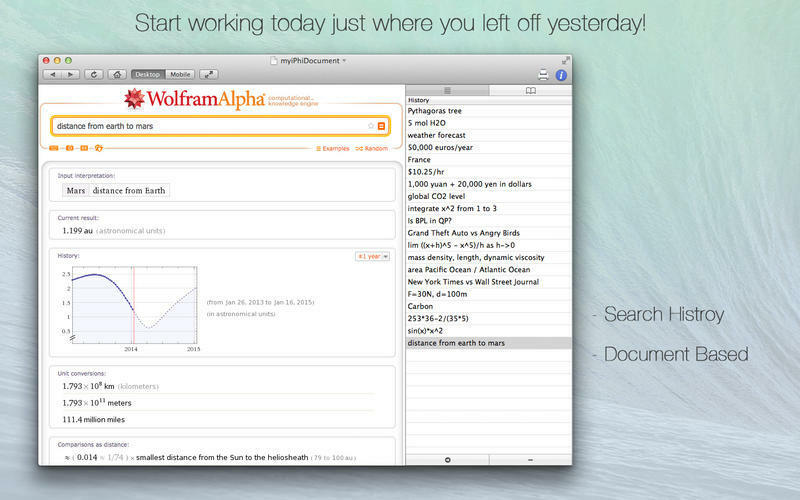 These Moduls generate Mathematica™ compatible search queries that can be copied to clipboard. 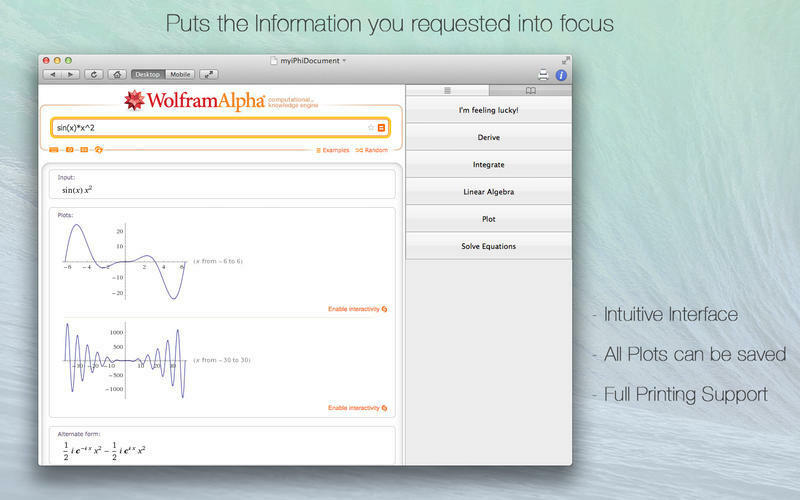 Compatible with desktop and mobile versions of Wolfram|Alpha™. When using the desktop version, iPhi automatically scales the view to the information you requested. Download capability for graphics and data. Printing and export to PDF support for your results. 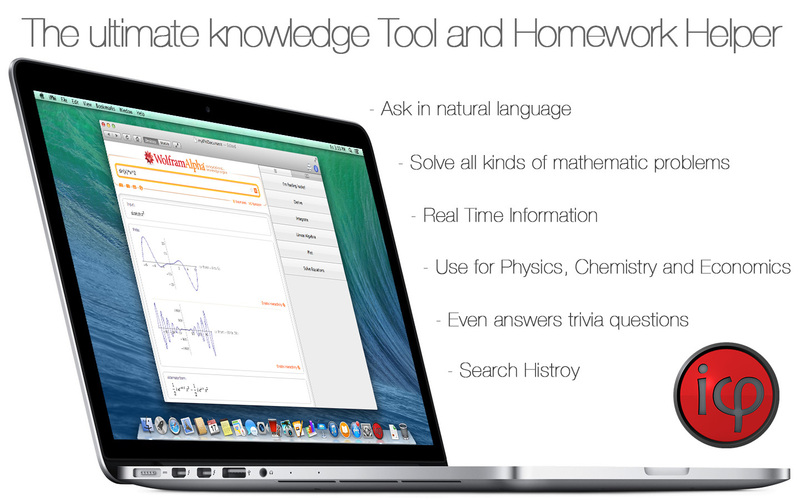 Compatible with Wolfram|Alpha™ Pro that provides even more detailed info. "I’m feeling lucky" Button that gives you a random question and the answer to show what Wolfram|Alpha™ is able to do or to just have some fun learning.